Many, many years ago I was lucky enough to get the chance to beta test one of the very early versions of the BBC's iPlayer. Back then it was called iMP and was a very different service. What I saw though was the dawn of iPlayer, and for all its faults the one thing you have to credit the BBC with is doing things properly. The company has a really strong heritage of this, from setting standards that are used at all broadcasters to never settling for anything but the best technology. As iPlayer evolved though it became something I wouldn't have predicted, it became the gold standard in streaming video. Interestingly though it's not actually the best quality streaming offering, companies like Netflix and Amazon do better with their services, but what iPlayer has is something more valuable. From the start this service was marketed as catch-up TV. And that's what it is, and that's why I love it. I have not for many years followed a TV schedulers whim about what to watch, and when. If I'm not in the mood for Doctor Who on early Saturday evening then I'll watch when I am in the mood. If I go out, I don't want to set a recording up, I want to type in a command and watch what I missed in a few seconds. 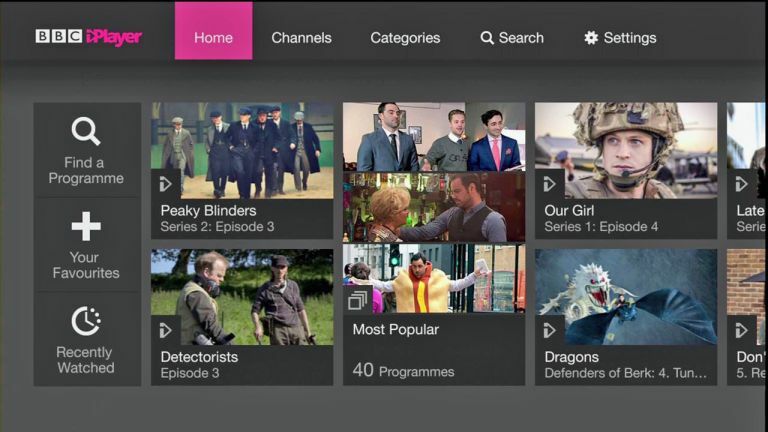 iPlayer is a success because it contains pretty much everything the BBC broadcasts. I use it with my kids so they can watch the rebooted Clangers. I watch Have I Got News For You on it when I should be working and I sometimes watch the things that I wouldn't bother with the rest of the time. It's also quite important to remember that along with TV, iPlayer features pretty much every radio programme from the last 30 days too. I use that a lot for comedy on Radio 4 and I don't know any other broadcaster that comes close. In fact the BBC basically had to take the lead with the joint venture with commercial radio to deliver streaming and on-demand radio. Radio Player feels far more like a BBC product than anything else. Other broadcasters like Channel 4 and ITV have their own catch-up services which are, if I'm honest, utterly dreadful. Both of those examples require that I register to use them. I don't want to register. Why would I? I don't have to register to watch the bloody TV - well, apart from the licence fee, but that's not something that broadcasters get to see. The quality too is absolutely pitiful. When Channel 4 relaunched 4oD as All 4 it had the perfect opportunity to introduce HD and bring on-demand TV screaming into 2010 territory. Instead, the company opted to relaunch with limited device support and only SD. I've left Demand 5 out of this, but while the quality is still fairly bad on a PC it's registration-free. However you look at it though, the BBC has iPlayer and it makes every other service on offer look stupid. And that's not just true of the UK, if you jump on a VPN and take a stroll to the US you'll see that they don't have anything of this caliber either. Hulu is, well, it's got some content that's worth watching, but you have to pay for all but the basic service and it still has adverts. So what do I want. Simple, please let's have the BBC open up iPlayer to everyone else. ITV, Channel 4, 5, Sky etc. Just send your shows to the BBC and let them deal with it, because it's the only company that really gets it.